i need a quick html snippet that can work in lament iweb, everweb or any other simple user to easily edit and script. 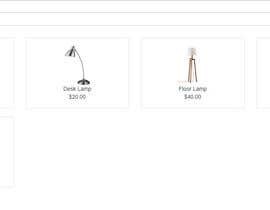 basically a search box that displays the names of items and its price is a shadow box as a result.. for the example use ebay as your price and item name for results and use the first 3 cheapest options. must be able to be used to search a msql server for information later. you can display images if you like as well as the link to the item or an example of each, picture version, non picture version and sql search.